A talentless actor is the adoptive son of a famous Kabuki actor. He leaves his family to be with his brother's wet nurse. He becomes a minor actor and eventuallty an itinerant one. This experience leads him to become a great actor and his wife make the ultimate sacrifice of leaving her husband so he can be successful in Tokyo again. When the actor comes back to his wife which his father has now accepted she is dying of tuberculosis and he is a star. While he bows to a loving public, she expires. I love Japanese cinema, but had not had the chance until now to watch any Kenji Mizoguchi films. Eclipsed by the fame of his contemporary Akira Korusawa, Mizoguchi was also numbered amongs the great Japanese directors, and the reason why is easy to see in this early work of his. 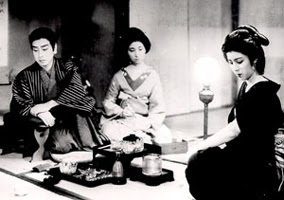 The story of the film is one of those big melodramas which we've all seen before, but the Japanese context of the story gives it an extra layer of alienness, the Kabuki settings and makeups, even the architecture transports you to another place and time. More than this, however Mizoguchi is an expert with his camera, his characrters shine on a scenery that makes great use of blank space, be it the Japanese tatami covered houses or the night scenes outside. Mizoguchi is also a lover of long takes, and some particularly good camera angles, like when the actor is running to see his wife near her death, transmiting a sense of urgency and despair. The film is actually very long, about 2 and a half hours, but this helps you empathise with the characters and give you a sense of how long things took in the film's universe. A worthy film, but I am still expecting better things from Mizoguchi. Here's another film you can't get anywhere! Well actually you can download it off eMule and find a Spanish .srt file to go with it. This only works if you understand Japanese of Spanish however. A pity. In his middle films, Mizoguchi began to be hailed as a director of "new realism": social documents of a Japan that is making its transition from feudalism into modernism. The Story of the Last Chrysanthemums (1939) won a prize with the Education Department; like the two abovementioned films, it explores the deprecatory role of women in an unfairly male-centered society. During this time, Mizoguchi also developed his famous "one-scene-one-shot" approach to cinema. The meticulousness and authenticity of his set designer Hiroshi Mizutani would contribute to Mizoguchi's frequent use of wide-angled lensing. A little stagecoach filled with a variety of people has to make its way through Apache infested territory. This is the first modern western on the list, the only other one before this was the Great Train Robbery back in the 1903. Since then pretty much all westerns had been B-Movies for a young and non-discerning audience. John Ford shows up to change that forever and also bring John Wayne to stardom. I was never a big Wayne fan more for his personal beliefs than for his acting, because I must admit I haven't watched many Wayne films - I was always partial to the Italian school of westerns myself. This said I am a huge fan of Westerns, particularly Spaghetti Westerns but also American westerns from the late 50's and 60's, not to mention Deadwood which is my favourite TV series. 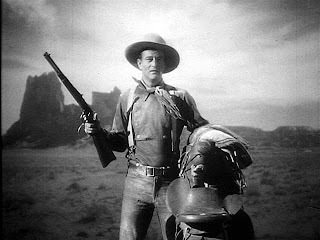 John Ford is, however the daddy of all these films and with Stagecoach he makes Westerns respectable. The film is actually pretty great, it - like most great films - focuses mainly on character development in the first hour fo the film so you can actually care about the action happening in the last half hour. Each passenger of the stagecoach has his or her own extremely well developed personality, back story and intentions and this makes the interactions all the more interesting. This can only be brought together with great actors of course, and this film certainly doesn't lack that. Actually Wayne pales in comparison to other people, with special mention to the Doc which deservedly got an Oscar for best supporting actor. Although there is only really one action scene it's an amazing one and well worth the price of admission. It is a very watchable, very fun film which is also a pivotal film in cinema history, can't ask for much more than that. Get it at Amazon UK or US . Stagecoach has been lauded as one of the most influential films ever made. Orson Welles argued that it was a perfect textbook of film making and claimed to have watched it more than 40 times during the making of Citizen Kane (1941). Akira Kurosawa noted that Stagecoach was one of his favorite films and influential in his making of Seven Samurai (Shichinin no Samurai) (1954).